« For Future Doctors : How Doctor’s Want to Die……….. Journey to the Theme Park City of the World……………. It has been 5 days since I landed back in Malaysia. Even though my tiredness has not disappeared, as per usual I have to return to work on 11/06/2013. No work, no money mah! That’s private doctor’s life. 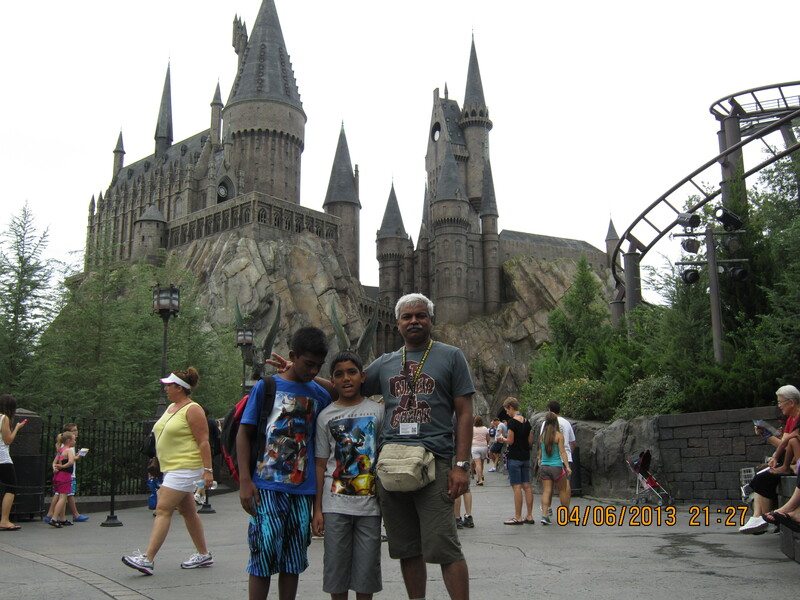 My family had a wonderful time in Orlando from 31/05/2013 till 7/06/2013. We visited 6 parks in 7 days in one of the biggest adventure I had ever taken since my journey to India when I was a 4th year medical student (for elective posting) ! Frankly speaking, this was my first overseas vacation as a family other than Singapore. Even though I had visited several countries for conferences etc, I never went with my family. The main reason was due to cost. Me and my wife are not from rich families and we do not have any inherited money/properties. My father was a teacher and mother housewife. My wife’s father was an ex-military officer and mother housewife with 6 more siblings. We learned to live together without any support from anyone else, all by ourself since the day we got married. After 16 years of service and 3 years in private sector, only now we could afford to do so. After the longest flight that we have ever taken from Singapore to Dubai(7.5hrs) to New York (13.5hrs) and finally to Orlando (2hrs), we finally reached Orlando around 4.45pm on 31/05/2013. Immediately after reaching Sheraton Vistana Resort (I got this via Timeshare Exchange), we bought our theme park tickets for the next 6 days. Walt Disney World was just 5 minutes away and the rest of the theme parks were just 15-20min away. Our real adventure began the next day when we made our first visit to Walt Disney World(WDW). WDW is a huge resort which belongs to Disney and has 6 theme parks within, including 2 water theme parks. I decided to visit only 3, which includes Disney Hollywood Studios, Magic Kingdom ( the original Disneyland) and Disney’s Animal Kingdom. It was a wonderful experience especially the grand finale of Magic Kingdom when they had the spectacular light show on the Cinderella castle and the fireworks. After 3 days of WDW visit, we turned to Universal Orlando resort which has 2 theme parks, the Universal Studio Florida and Islands of Adventure. These theme parks are for older children as well as for adults (with no heart disease, hypertension etc !!) and for the first time, I saw high and lengthy roller coasters which I have never seen before. It was fun with Marvel characters, indoor rides including 3D rides and many more of Movie characters/rides. The rollercoasters were huge and after riding all of them several times, I can consider myself immune to roller-coasters! The Wizarding World of Harry Porter was their latest attraction since last year and it was really worth it. You’re flying with Harry Porter on a broom (supposerdly) ! The final theme park was Seaworld Orlando. 2 more huge roller coasters, nicknamed Manta and Kraken! For Manta, you face downwards ! Seaworld had few good shows like Dolphin show and Whale shows which was so well done. They had a lot of rare animals including huge polar bears, sea lions etc. Overall, it was an enjoying journey and the journey back was the most tiring and sad one. Would love to go there with my family. How much would it cost for a family of 4? The biggest cost is actually the flight. It cost us RM 28K for 5 of us. The rest depends on your accommodation and number of theme parks visited. 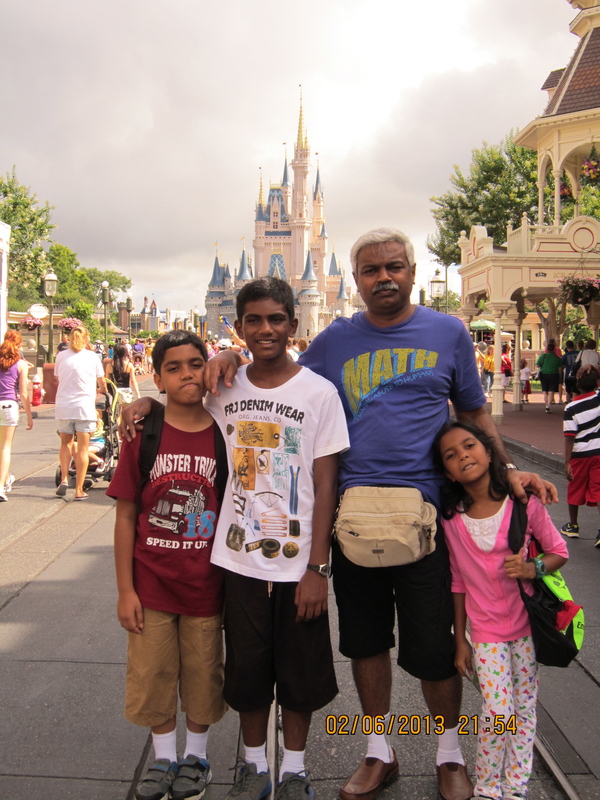 I visited 6 theme parks which cost us total USD 2500. Glad you enjoyed your holidays. The original Disney park is actually the one in Anaheim, which was opened in 1955. It is called Disneyland. His company, after he died, developed a theme park in Orlando called Disneyworld, actually a huge complex, with the first theme park opened called the Magic Kingdom, which is a almost exact copy of Disneyland in Anaheim. Yup, what I meant was original disney theme park in WDW. glad your family had a wonderful time. you made the right decision of taking your children to disneyland as i would advise anyone with children to take them to disneyland. its every children dream. I took my children to Disneyland paris 10 years ago It was trully an experience and they really enjoyed it. now one will be working very soon n the other one going to college . Reminiscing their inocence smiles , laughter while flipping through those pictures taken in disneyland is really priceless. Now hopping to make another trip to Original Disney US, but it wont be easy because the children have grown up and busy with their own work. For those who are considering bringing children to these theme parks, there are a few advises. The right age is important, not too young, and not too old. There are height restrictions for some of the more ‘terrifying’ rides, and younger children may not be tall enough to ride. Older children may get bored with some of the attractions designed for young children. Generally, I recommend that the best time to go is when the children are in their early teens. They will enjoy it most at that stage. Both LA and Florida have generally mild weather, but summer can get pretty hot. Their winter is pretty mild, so I would recommend going in late autumn to early spring to enjoy the outdoor best. Even in the height of winter, the daytime temperature can be a balmy 60’s (do note the Americans still use the Fahrenheit! so that is high teens to us), perfect for theme park activities. There are many parks to visit, so it is worthwhile spending more time, after all, so much time and effort has been made just to get there. For Malaysians, water parks are nothing, so I would recommending skipping that, as Paga did. There are 4 parks in Disney World worth visiting, Dr. Paga did not go to Epcot. There are also 2 parks in Unversal Studios like said, and then Sea World. An hour’s drive away is Kennedy Space Centre at Cape Caneveral, where the Apollo programme, and later the Space Shuttle programme took off. It is interesting to visit it, and see the saturn V rockets up close. The kids actually enjoyed that very much. No rides, but lots of information and knowledge gained. There are some other parks further South, at Tampa, but it’s probably not worth visiting. The best duration is thus 2 full weeks, with 2 days used for travel, and 1 day for recovering from the Jetlag on arrival. We actually spend 16 days, staying with an ex-colleague who lives in Celebration. That is Disney’s housing development, within 15 minutes from all the parks. When we are young we spend all our health to serach for the wealth and when we are old we spend all our wealth to search for the helath. Good Health to you and all who reads this comment. common problem.. when we are young, got time , got energy but not enough money, Later in life, still got energy, got enough money but very little time… then get older.. Got money, got enough time but no more energy… sigh..
Can any body show me a career that I can spend my free time without the need to think about money… he.. It is possible to enjoy life without spending lots of money. This is just one way, spending time in ‘the happiest place in the world’. The middle phase, having ‘no time’ is an illusion, it’s not real. I have colleagues who do not take leave, because they start counting the ‘lost income’. I took a conscious decision at that point, to work, and work hard for 11 months in a year. And to allocate 1 month off work. Income is calculated, and expected, based on 11 months work, so I do not feel so bad about the lower income. And I have indeed been taking a whole month off each year for more leisurely activities, be they professional conferences, AGMs, or holidays. Lately, I have been taking actually more than that. 🙂 While my legs can still walk, I had better see the world. Muslim or Hindu, relevant kah? Is it wrong for me to ask? What do you assume if some one ask such question? Is religion relevant to the context here, Mr Z? I am asking because I saw his wife wearing a hijab. I thought Dr. Paga is Hindu. I just want to be clarify. That’s all. Whether his wife wears a hijab or not should have no bearing on the issues discussed. Gosh, I wasn’t aware that MQE was abolished in private institutions this year. So, is it back to square one in UKM/UM and USM? This is definitely good news. What I find amusing in the article is that it was mentioned twice that these graduates passed the European Union examination for medical graduates to obtain practising licences. If they can pass these EU examination, then MQE in public universities shouldn’t be a problem isn’t it? I wonder which foreign lands they are earning a livelihood in. I doubt any countries iin EU although they have ‘passed European Union examination and obtained practising licenses’ as EU has currently strict employment rules from employing non-EU. One step to bringing back the glory of the Malaysian medical profession. so, you didnt go to Cedar Point to ride the best rc ride in the world?